If you’ve ever watched HBO’s comedy Veep, starring Julia Louis-Dreyfus, you know that Selina Meyer’s workwear represents some serious wardrobe #goals. First she was the vice president — then the president! — and, well, if you’re not yet caught up to season 6 we’ll leave it at that. Part of the plot is that she’s bumbling, inconsequential, doesn’t accomplish anything — and is super mean about all of it to her staffers while presenting a smiling face to the public. Her main goal seems to be staying in power for power’s sake. But whether you think she’s a brilliant politician or her character represents a big part of the problem, her wardrobe is always on point. We wondered what lessons we could learn by taking a look at her wardrobe, and if you wanted to, what are the best tips for how to dress like Selina Meyer in Veep? What are her style secrets? Selina Mayer not only has clothes that are incredibly tailored to her body, but she also makes a fairly bold move with what some would see as under-accessorizing. Sure, she’s wearing a delicate necklace and gold bracelet in the picture above with the blue dress, but with all of these looks I know I would be tempted to add a brooch or a heavier, more statement-y necklace — she does not, and it ends up being a very decisive, let’s-get-down-to-business look. It’s also interesting to note that she prefers solids or allover patterns like animal prints — she’s not really one for stripes or floral details. We often see Selina wearing a skirt suit — she’s very rarely in a pantsuit, and only sometimes in a dress + jacket combo. I’m not sure if that’s a commentary on women politicians having to dress in affirmatively feminine ways (she rarely wears pants at all — I can only think of times when she’s traveling or at home relaxing when we’ve seen her in pants), or if it’s something less nefarious like her wardrobe team thinking skirt suits look better on Louis-Dreyfus’s body type or something — but I love the skirt suits and think they’re a great formal look. I’ve called these kinds of necklines “personality necklines” before — the scalloped neckline in the red dress, the unusual portrait/cowl neckline in the pink, the wide collar of the black, or the four-point, squared neckline of the purple dress — and she rocks them all. They help to keep with her style of minimal yet bold dressing. She wears a surprising number of fitted blouses with skirts in general, but the looser, bowed version seems to be a particular favorite of hers. In real life I often find these kinds of blouses to be a bit too fussy and complicated — where exactly do you tie the bow, again? 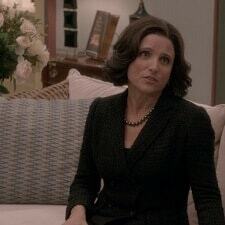 — but Selina Meyer’s stylish collection makes the tie-neck blouse look like an easy, almost default choice. I was intrigued by how many belts I noticed her wearing — they emphasize the tailoring and her trim figure, but I think they also add some visual interest to the outfits. I like the black wide belt with the white blouse the best (the picture above on the phone at far left), but the matching belts in the red and navy pictures were interesting and nice, and the slender belts of the green dress and skirt suit were also great. In earlier seasons she wore more brooches with cardigans, dresses, and blazers. I’ve written before of my love of a good brooch, and we’ve talked about how to wear brooches in the past as well. Yasss! Selina is my style icon. She wore an amazing white dress and black belt combo in this week’s episode. I think she gets kind of an unfair reputation as being incompetent – she’s definitely power-hungry and cutthroat (and a terrible mother) but most of her big eff-ups have really been the fault of her staff, who (aside from Sue and Gary) are pretty incompetent. Where is Sue this season??? I miss her! Apparently the actress who plays her had to take time off for personal reasons. Oh man — I was hoping she’d come back in a blaze of glory in later episodes this season! Suggestions on where to find belts like these that are reasonably-priced? +1 – Why are belts so expensive!? I have bought narrow leather belts on clearance at Talbots and JCrew for under $20. Target has a good selection of belts. This is where I buy mine. Macy’s usually has really great sales on their belts (Ralph Lauren, Calvin Klein, etc.) I have found some pretty good deals there. Fashion help needed – 6 weeks pregnant, and it occurs to me I need to swap out my sheath dresses for something more flowy for the interim before I begin showing, and the trapeze/fit and flair style might work (although I don’t think most are work appropriate…) For other ladies who’ve been through this, would a more fluid jersey or more solid knit fabric be a better choice? I found ponte dress, fit and flare worked really well for me. I mostly bought solid colors and then added a jacket on top, but if you find patterns they’re ever better at hiding bulging tummies. I’ve found that nobody really notices (or at least nobody dares comment) until you are very visibly showing, so don’t worry too much. I don’t think I’d bother spending extra on a dress whose sole purpose is to hide a belly for a few weeks. That said, I have had better luck with pants that were a bit too big for me, if you have any in the closet, since they break up your midsection. Wearing blazers and light scarves also helps. Watch out for this! In my first pregnancy I realized/thought no one noticed and kept wearing sheath dressed as long as I fit in them. This time around, I tried the same thing, and found that my boss’s admin asked me if I was expecting at around 8 or 9 weeks! Leaving aside the inappropriateness of the question, it clearly was more visible than I realized. I quickly switched to pants and flowy shirts for the next few weeks until I was ready to tell people. I also wouldn’t invest in new dresses at this point, but if you have flowy shirts, start on maternity pants as soon as you need to. Oh man, if I ever win the lottery you can bet my wardrobe will become entirely Selina Meyer-inspirted. It’s not even that much of a long shot. Do what I did. Go to the local old rich guys club and find a geezer with a bank account and a libido. If you don’t mind having to do the guy 3-4x a week, all your material needs will be satisfied. You will have to dodge the wife which is somewhat of a drag but you will have great jewelery and clothes! How does this make it through m0deration but everything I post is carefully reviewed until long after the discussion is over?! Does this show get better after the first few episodes? I watched the first two episodes and found it unoriginal, not funny, and generally not entertaining. Sacre bleu! Veep is amazing. I don’t recall hating the first couple of episodes or anything but I do remember thinking the show took a few episodes to really hit its stride, so I’d give it another episode or two. I think there are some shows that are just like that for some people. I feel the same way about Parks and Rec, no matter how many times I’ve tried. Meanwhile, I’m in politics and Veep is so dead-on I cry laughing because it reminds me of real people and events. Fwiw, I thought the first season of Parks and Rec was awful but I stuck it out and started really liking it in Season 2. Agree. I’d skip the entire first season of Parks and Rec entirely (read the wikipedia summary) and start at 2. Different strokes for different folks. 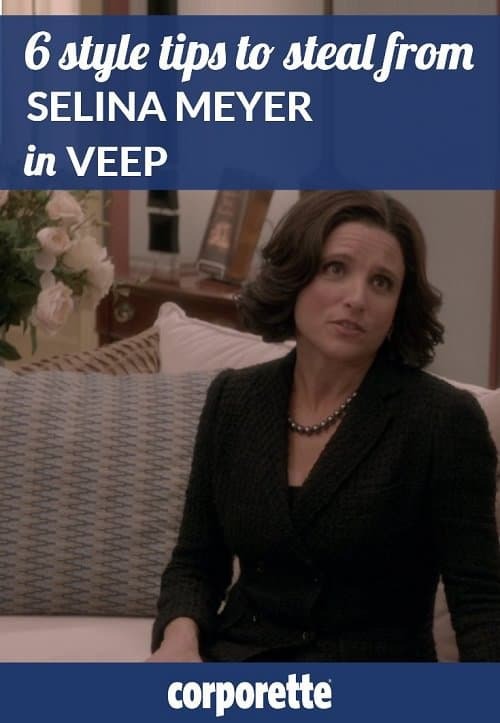 I think Veep is the funniest show I’ve ever watched. Isn’t one of the really early episodes the one where they go to the frozen yogurt shop? That is the funniest episode of TV I’ve ever seen. That’s the second episode ever. This is my next binge once we catch up with GoT. Now I’m suuuper stoked. I find that taste in comedy is so variable. I also didn’t like Veep. But I loved her clothes. I’d add the Marisa Dress from Boden as another dress-like-Selina option. I freaking love her style… though the few times I’ve tried to find specific items she has worn on the show, the prices have been OMG expensive (one dress I loved was $2700+). She wore an Alexander McQueen dress also worn by the Duchess of Cambridge in the season six premiere! I spotted that, too! It wasn’t exactly the same but substantially so. Either one or both had it customized. I know that the DoC works closely with Sarah Burton so probably her. Unless it’s from the Limited collection! (RIP.) But seriously, that collection had some adorable pieces in concept, not in actuality for me. I don’t think it was worth the original asking prices, which were super high for The Limited, but I liked the collection. Speaking of TV shows, I’m going to out myself as the biggest nerd ever, but is anybody else really enjoying the new season of Doctor Who? I am crazy about Peter Capaldi and I am loving the new companion. I was not a huge lover of Clara the Impossible Girl so I am very happy with recent developments. I actually stopped watching after Capaldi’s first season because I couldn’t stand Clara and was so disappointed when she was supposed to leave but didn’t. I’ve been meaning to catch up since I do love Capaldi and the new companion looks great, but I’m concerned I’ll be totally lost. How much of a crazy plot arc did I miss that would continue into the current season? Not much at all. They are kind of rebooting. If you feel like you want to brush up, there are a ton of web sites that recap all the episodes, but really I don’t think you need to. Also big Doctor Who nerd and I have watched all the back netflix episodes too (not from the ’60s but from the ’00s) and find that I always hate the new companion or Doctor at first and then grow to really like them! I’m waiting to start until a few episodes in. But I too seriously did not like Clara. She and Capaldi did not fit/had bad chemistry together. Sat watching an episode right now! This is my favorite post in quite a while. I bought a couple of pairs of the Puma flats and love how comfortable and cute they are, but after a couple of months, they smell. I don’t usually have foot/shoe odor issues so this is unusual for me. Any suggestions on solving the problem, and hopefully keeping it from returning? I haven’t had that problem with the Puma flats but have with other shoes. Check out Summer Soles (summersoles dot com). I use them in most of my shoes. Baby wipes! Wipe out the soles, and then use a new wipes to do the sides/top of the interior. The detergent in them is super gentle, but it will get rid of anything that’s built up in the shoe. Then if they still smell, pour in baking soda once they dry out. It will absorb most of the odors, and then you dump it in the garbage before you wear them again. I’d love to see a similar post on Leslie Knope! Yes! Or even just a roundup of “secretary” blouses. Veep and Madam Secretary definitely have those in common. Yeah, she (well, her wardrobe) is my fave. But I think the recipe for looking like Claire is simple: buy expensive dresses, have an incredible tailor, have an incredible, size-0 body, and be able to do everything in 4-inch heels! Even though the Good Wife is over, I think a similar post on Alicia Florrick or Diane Lockhart would be fun. I was so disappointed when I read an article a while back saying that all Leslie’s clothes were $$$ too. It also helps to be super skinny and rich. Stop trying to make broches happen. I feel like I could use a brooch in my life. They’re a great alternate to a necklace when a dress has a tricky neckline, and they call attention up to the face vs. the lower half of your body. I really liked whenever Christina Hendricks would wear them as Joan on Mad Men. Madeline Albright made them happen! Now that I’ve seen it broken down like this, this is how I dress. I don’t complicate dresses with cardigans or jackets unless I am wearing a suit. (The whole beauty of a dress is that it is an outfit in one step!) If I’m wearing a suit it is always a skirt suit and typically with a blousy top and have several secretary-type blouses, too! Also almost always go with solids over patterns (unless leopard, which is a neutral!). I don’t wear brooches, but if I wear anything with the dress it is usually a necklace or a scarf. This is how I already dress but it helps to have it defined out like this so that I can use it in my head going forward as opposed to just “what I gravitate toward.” JLD has been described as my doppelganger, though, so maybe that is why! I wear cardigans and jackets as much because of A/C as anything else. You guys, I love a dress, but I HATE having to make sure my legs look appropriate. I would wear so many more if I had laser hair removal. Does this justify, from a cost-benefit perspective? This was my thinking, and I was told I’m a perfect candidate – dark leg hair and pasty-pale skin. Alas, $3500 later I’m still shaving twice a week. If you go, I would see whether they will give you at least a partial refund if the results are mediocre. I’m SE Asian with a Frieda Pinto/Aishwarya Rai complexion and lots of thick black hair…everywhere. Laser hair removal has made it possible for me to wear dresses/skirts without having to think about whether my legs looked good or not. I loved the experience so much that I’m now doing my arms. The place I went to did advise me that it might take more than 6 treatments–my legs looked pretty good with some patches after the 6, so when I bought the arm package we continue to touch up my legs. The type of laser appears to make a huge difference: we’re using the YAG, and my technician is very knowledgeable about where to zap and not zap. I also found them through Groupon, so I shudder at WestCoast Lawyer’s $3500 – I’ve probably paid that across many years of many different laser places and treatment areas, but these packages were like $400. I have a similar complexion, so wanted to understand your comment about the cost – did you say that the $400 package alone would have been enough in place of going to many different laser places? It sounds like you spent $3500 and then another $400 which is confusing. Has nobody brought up that they seem to be dressing her following several guidelines for petites? She doesn’t suffer from a short torso or high waist, but the brooch up high, the absence of large prints, the fondness for solids or all-over regular prints instead of swimming in gigantic florals, the small, understated jewelry, sometimes the narrow belt, those are all pretty Petite 101 concepts, and Julia Louis-Dreyfus is not a tall person. Heck, I just checked and she’s about my height, and I’m just south of 5’3″, and I have The Worst Time finding mall clothes to fit and I don’t see the point in shopping online without trying stuff on (no, I can’t return stuff promptly; seriously organizationally challenged). So basically whoever’s dressing this character gets it, and I wish more clothing manufacturers would ALSO get it and make more stuff like this instead of shortening hems, scaling down armholes, and just making smaller versions of clothes for average to tall people.